What are Cambridge International AS and A Level exams? Cambridge International Advanced Subsidiary (AS) and Advanced (A) Levels are internationally benchmarked qualifications providing excellent preparation for university education. They are part of the Cambridge Advanced stage which is in alignment with the Indian 11th and 12th grade curriculum. Cambridge International AS Levels has half the content of the corresponding Cambridge International A Level and may be completed in one year. 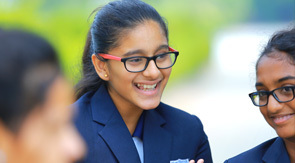 Schools can offer Cambridge International AS Level as a qualification in its own right or as a staged route to Cambridge International A Level by completing 2 years. Learners can study Cambridge International AS Level alongside other subjects to increase breadth in the curriculum and build further knowledge and understanding to other subjects they are studying at Cambridge International A Level. What is the International relevance for AS and A Level? Cambridge International AS and A Level syllabuses have been created specifically for an international audience. The content of International AS and A Levels is carefully devised to suit the wide variety of Cambridge schools worldwide and avoid any cultural bias. They are taken in over 125 countries and offer a choice of 60 different subjects. Cambridge International AS and A Level qualifications are widely recognised and valued by universities and employers alike. Some US universities give up to a year's credit as a result. Every year, thousands of Cambridge International A Level students gain places at good universities worldwide - including the UK, USA, Canada, New Zealand, Singapore and Australia. Three fair passes at 'A' level allows a student to skip a year in US, UK and Canadian Universities. What are the subjects offered for A level at Manchester International School? Take the AS qualification only – either at the end of a one-year or two-year course. NOTE: The A2 examination cannot be taken as a standalone qualification. We offer subjects in Science and Commerce streams. The flexibility of subject combinations and its International relevance makes it popular amongst the learners. We offer programmes that encourage high academic standards that prepare the students for competitive examinations. The school follows Oct/ Nov examination. Commerce Stream : English; Math; Accounts; Business studies; Economics & IT. Science Stream : English; Physics; Chemistry; Math/Biology & IT. What are grades available in AS and A level? Each subject that a Cambridge international student takes at AS and A Level receives a separately certified grade. From 2010, the Cambridge International A Level will be reported on a grade scale from A* grade, awarded for the highest level of achievement, to E, indicating the minimum required performance. There is no A* grading in the certification of Cambridge International AS Levels, which will continue to run from Grade A to Grade E. There is no core paper in AS and A level. What options are available after completing the A Levels? A level prepares the students for university education like graduation. It also qualifies the student to appear for entrance exams for any professional course of his / her choice. How are the teachers trained to teach CIE qualifications at Manchester International School? The CIE curriculum at Manchester International is enriched by our CIE certified facilitators/teachers offering personalised guidance and mentoring to our students. The facilitators at MIS undergo C.I.D.T.T. (Cambridge International Diploma for our Teachers and Trainers), face-to-face and online training. National and International seminars and conferences enable them to upgrade themselves in mark schemes, and examiner's report etc. The in house training department of MIS conducts regular workshops, internal seminars and exchange programmes for the integration of teaching techniques within the MIS family. Does A level curriculum prepare the students for MHCET/ PMT / IIT-JEE and other Indian professional entrance exams? Of course, A level curriculum is more practical and application based. It enhances student's knowledge, reasoning power and problem solving abilities which is required to clear all professional entrance exams. "The standards and commitment of the teaching and support staff is outstanding, as a parent I feel that they know and understand my children well and support them accordingly. My hearty thanks to the quality Manchester International School."